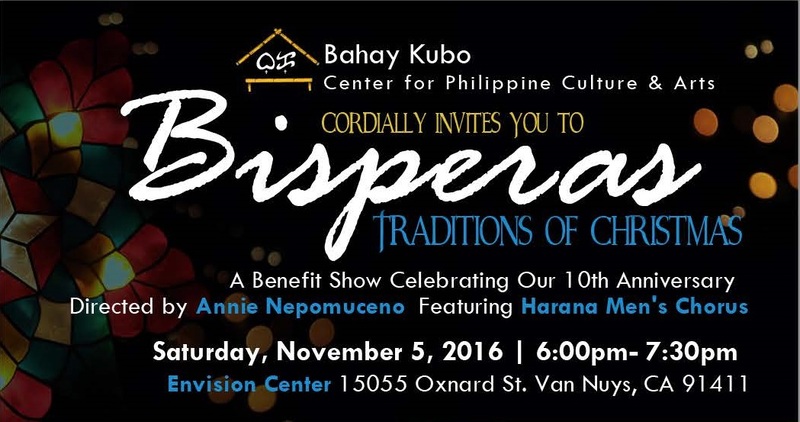 Bahay Kubo Center invites you to our special 10-Year Anniversary benefit show, with our traditional Bisperas event. Reserve your tickets today! For more information and ticket orders, call (818) 832-1941. 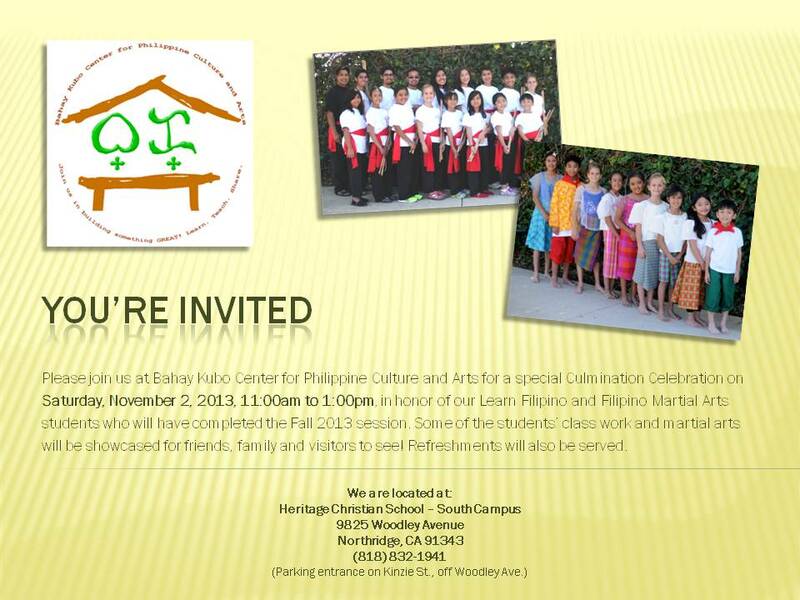 We are very proud to showcase our very own Bahay Kubo students from our Learn Filipino Program and Filipino Martial Arts as they perform traditional folk art dances and martial arts on Saturday, November 5th. With special guests, the Harana Men’s Chorus and our our longtime partner, Cal State Northridge’s Filipino-American Students Association (FASA), this show is written and directed by the talented Annie Nepomuceno. “Bisperas” is our culminating celebration of this year’s classes and activities. This also happens to be Bahay Kubo Center’s 10th Anniversary, so this is a very special event. We hope you will come spend this festive evening with us, to appreciate the rich culture and heritage of Filipino-Americans. Doors Open at 5:00 PM for Exhibit viewing and Filipiniana shopping! 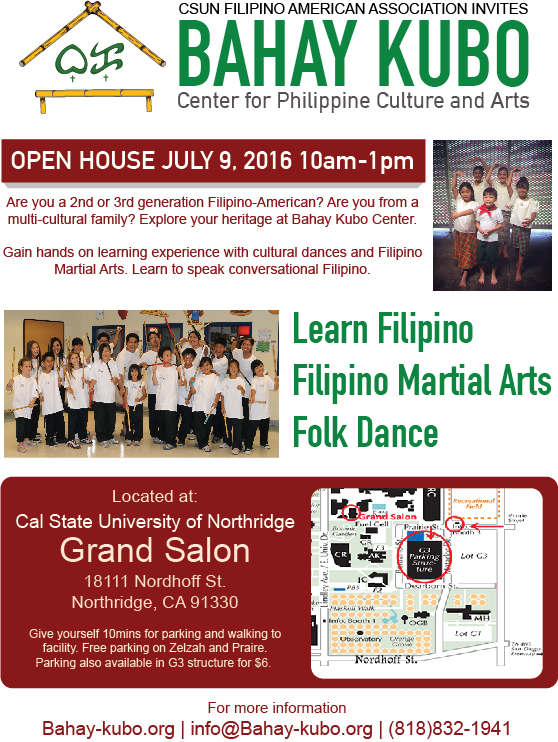 Bahay Kubo Center starts programs at CSUN by invitation from CSUN FASA. Starting July 16-October 29, from 9am-1pm at the Northridge Center area. Park at G3, inquire at guard post where to find the Northridge Center. Hope to see your children from age 5 to teens at our Learn Filipino Program, Sayaw Folk dance lessons and Filipino Martial Arts! For more information call us st 818-832-1941! For more information, download the brochure. If you are ready to sign up, download the Registration form. Download our 2016 Program Brochure. If you’re ready to enroll, download the registration form here. 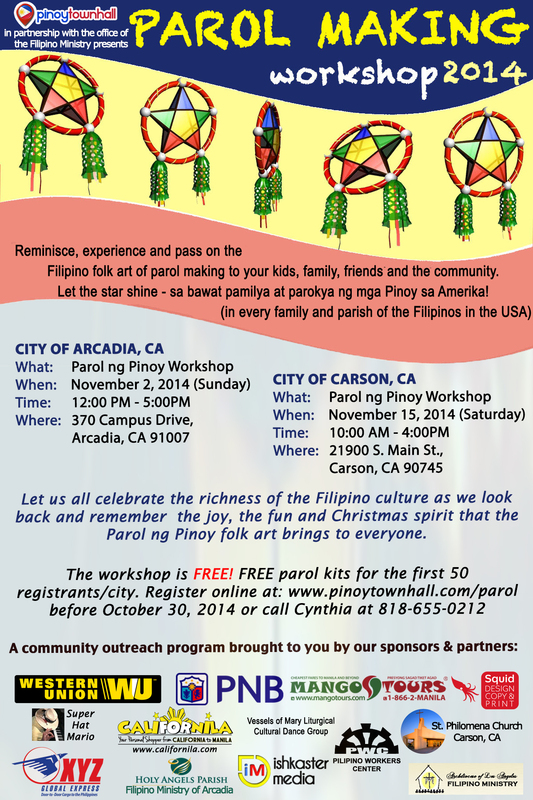 The Parol Making Workshop is back! In August of 2011, we had the pleasure of joining the Parol Making Workshop held at our very own center along with Fil-Am Arts. Friends and family of all ages enjoyed this day of crafting parols of different shapes, colors and sizes. If you’ve never seen or made one of these before, or if you missed the last workshop, you’re in for a fun-filled treat! We are all invited to attend this great crafting experience on November 2nd and 15th. Please see flyer above for more information. You may also print the attached flyer. Bahay Kubo Center is currently not in session. The 2014 Learn Filipino Program and Filipino Martial Arts classes are currently closed. The Board of Directors are presently in the planning and assessment phase in preparation for the upcoming 2015 year. If you are interested in our LFP or FMA classes, please sign up to be on our mailing list and prospective roster to receive important announcements. 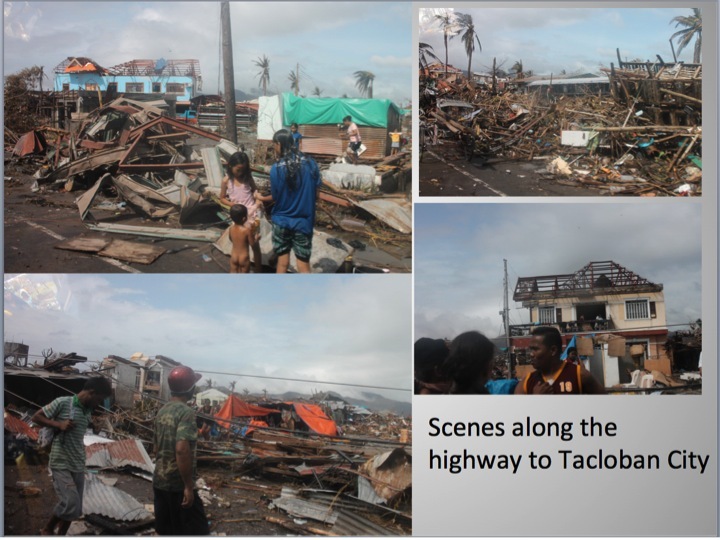 Friends, your donation will firstly go to Northern Cebu and Ormoc in Leyte, specifically. 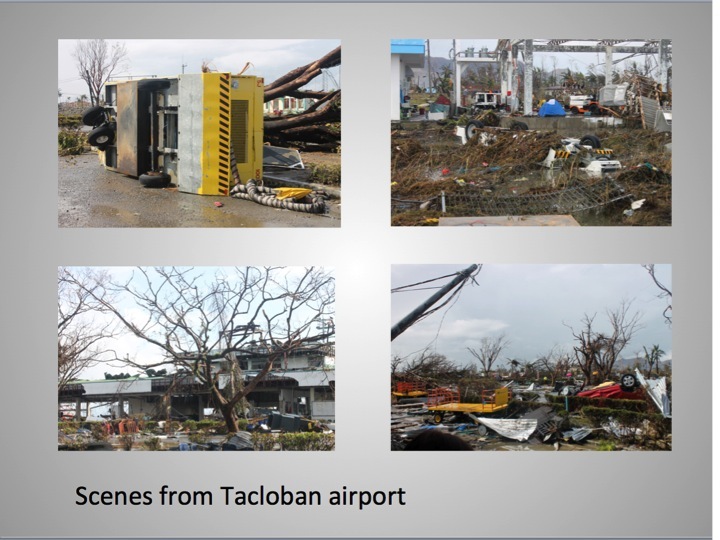 These places have not been reached as a lot of the large companies and organizations are focusing on Tacloban. 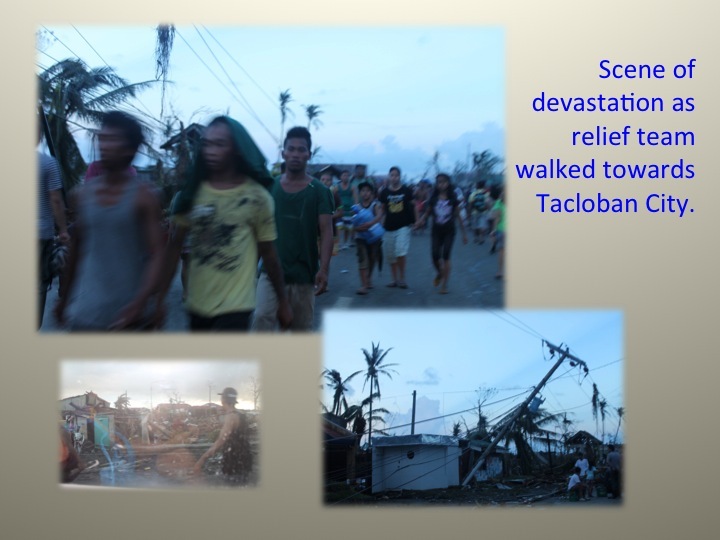 Today, our efforts are wholly devoted to providing food and medicine. In a few weeks, we will switch to providing shelter. Finally, we will be engaged in the third and longest phase – rehabilitiation and recontstruction. These are the challenges before us. 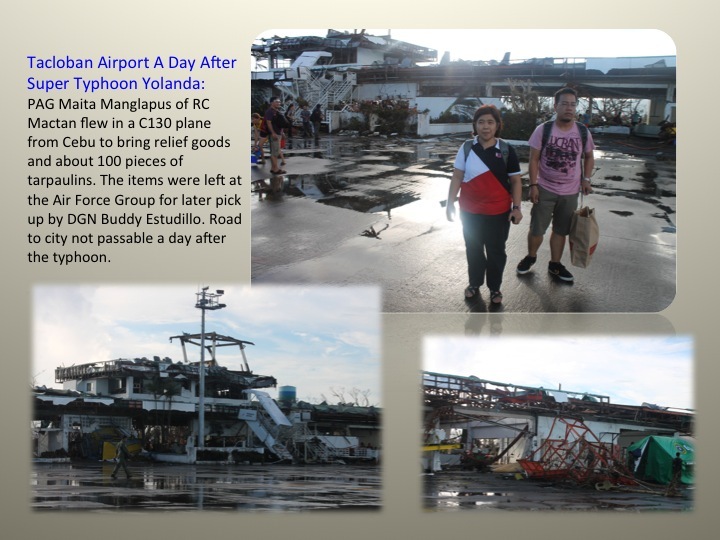 You will receive periodic reports on our relief activities. Please email us if you have any questions: info@bahay-kubo.org. 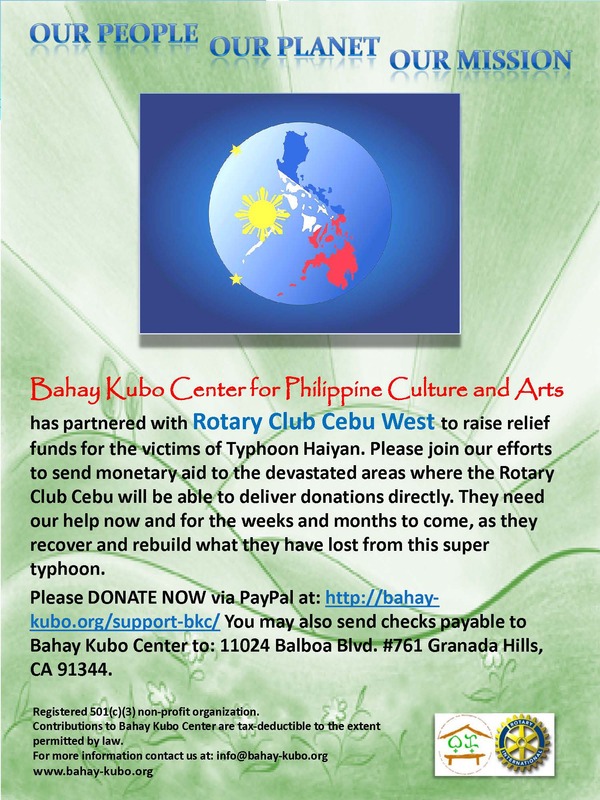 Bahay Kubo Center will distribute 100% of the donations to the Rotary Club of Cebu West, who will directly act upon our mutual objectives of relief and help to the typhoon Yolanda (Haiyan) affected people.Thank you very much. On Sat Nov 17, members of our club are going to San Remigio. 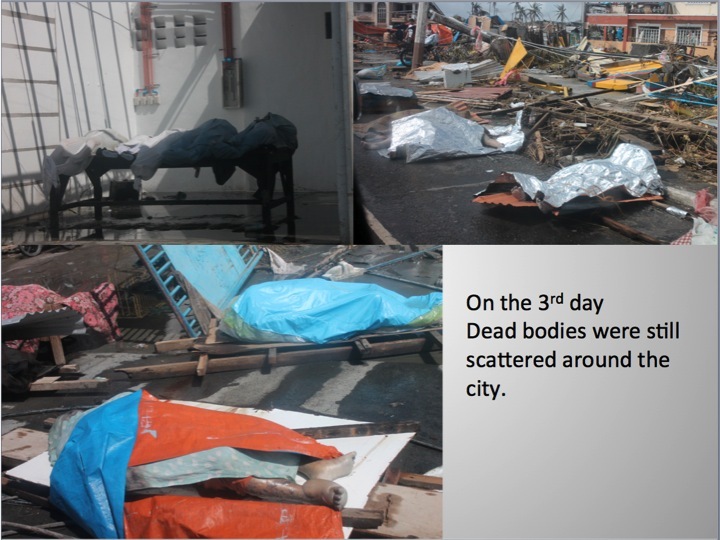 Other clubs in Cebu will go to Medelling and Daang Bantayan. 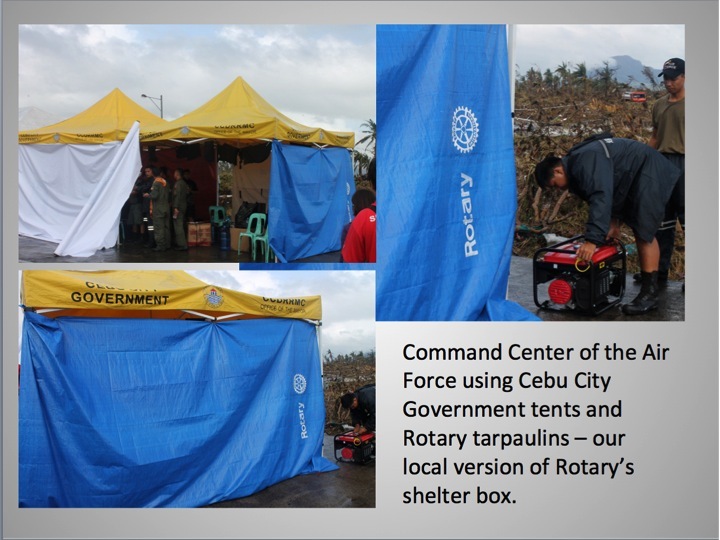 District 3860 to which RC Cebu West belongs is focused on relief operations in northern Cebu and Ormoc. reports 90% of houses destroyed. 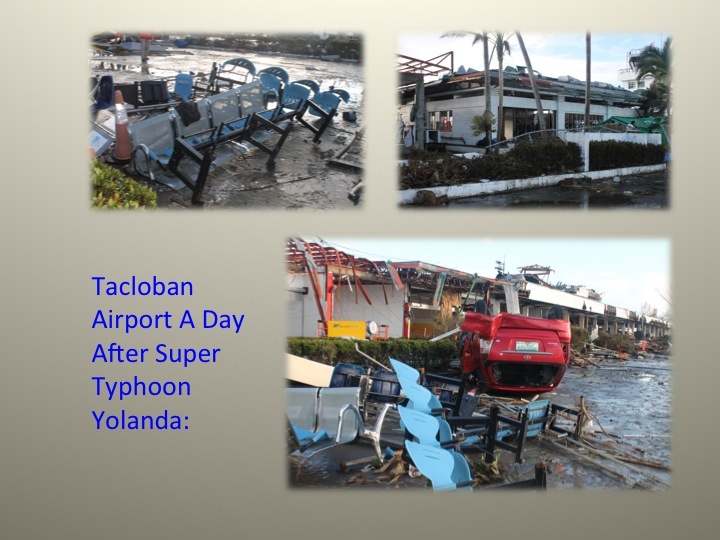 The immediate needs are food, water, medicine and temporary shelter. 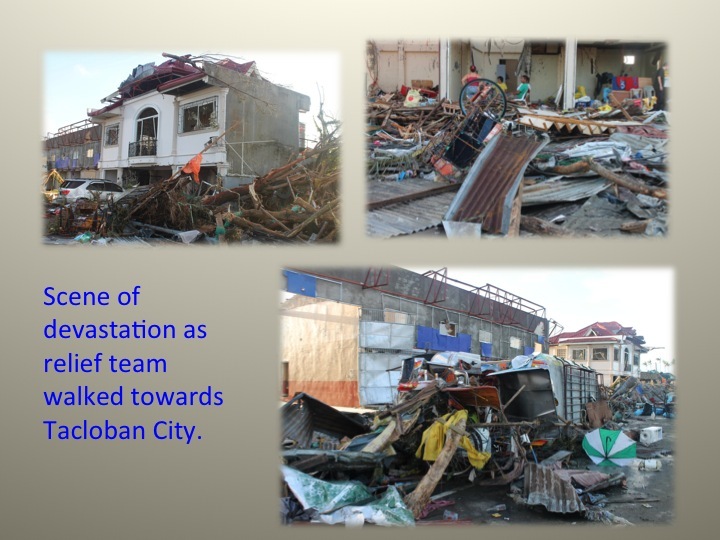 Reconstruction and rebuilding of communities will take years. 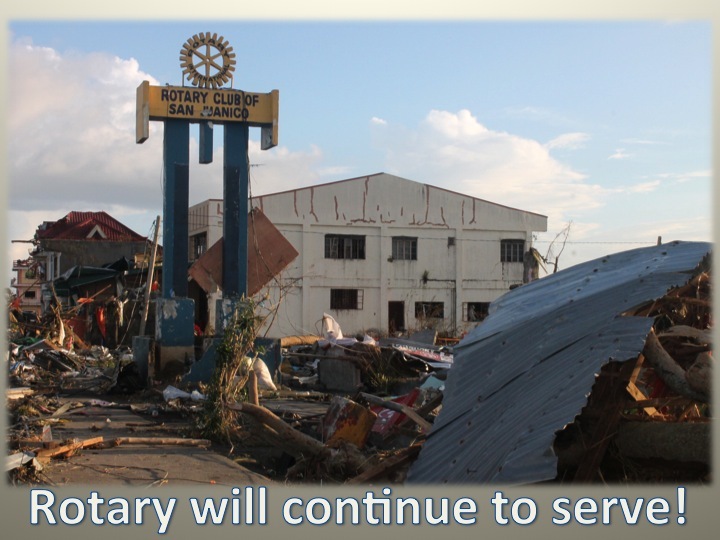 We in Rotary can only do so much to help government perform its function. We do not have enough manpower and resources but we will chip in as best as we can. your reference. Please feel free to forward it on to your friends. 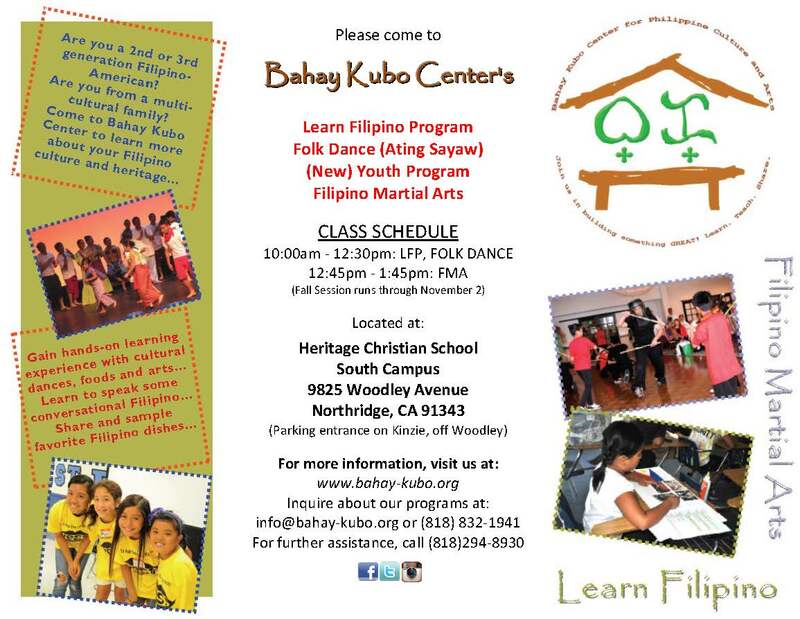 Bahay Kubo Center Classes on now! Our Learn Filipino Program classes are under way! Tell your friends, cousins, classmates and your community about us! We offer great Filipino enrichment programs for first, second and third generation Filipino-Americans and families of multi-cultural descent. We will also be introducing our new, pilot Youth Program for teens! Immediately after LFP is our Filipino Martial Arts class! If you’re curious about what our programs are all about, stop by for a visit, a tour, or a one-on-one meeting with one of our teachers or officers. Learning about our rich culture is fun at BKC! Halina kayo sa ating Bahay Kubo Center! Come for a free trial class! Register now by printing and completing this REGISTRATION-FORM-2013, and bringing it to your first day of attendance. Thank you! How do you spot a fellow Filipino?